Registered nurse Patti Harris cares for Jasmine Bottoms, 12, after she returned from surgery for placement of a medal rod to straighten her spine. Jasmine is now out of the hospital and up and about. Take the elevator in Children's Hospital to the sixth floor. Turn right, then right again. About 60 feet down the hall on the left are double doors. Push the metal pad on the wall and the doors swing open. Welcome to the pediatric intensive care unit. At 23 beds, Children's pediatric intensive care unit is the largest in Western Pennsylvania. Heart defects, transplants, car accidents, overwhelming infections - every day, an unimaginable array of problems brings children into the unit. Here, strangers poke and prod and use big words to talk about kids, while their parents agonize over the present and the future. Most of the patients will get better and leave after a few days. They will have only dim memories of a visit they will recount years later when doctors take their medical histories. Others will spend months here, getting bored waiting for an organ or so sick they don't think at all. A few will die here. But all the people who care for the critically ill - doctors, nurses, therapists, families - come to it with a single purpose: To help a child live. Every day about 5 p.m., the doctors making up the critical care team gather near the doors of the unit, dressed in hospital-issued blues and comfortable shoes, ready for "rounds." Dr. Michael Whalen is 37 years old and looks younger, but he is the attending physician in charge here. During rounds, he will lead the group around the room to discuss each patient, bed by bed. "This is one of the busiest times the unit has seen," he said, noting that every bed is full. It is a rainy spring day, although it is hard to know that within the nearly windowless unit. Kirsten Magnuson, born last August, was taken to critical care for respiratory distress. The team slowly circles the room, reviewing each patient's story: A 15-year-old who had a liver transplant two days before. An infant who just had surgery to correct a heart defect. A 22-year-old on a respirator who has waited 10 months for a lung transplant. A 12-month-old with an overwhelming infection and multiple organ failure. A 13-year-old made quadriplegic by a car accident. Whalen rotates with other critical care attending physicians, taking charge of the unit's children for one week out of five. He also teaches the house staff, doctors called residents, who train in general pediatrics, and others called fellows, who train in critical care. Usually four of each work in the unit. By the bed of a child awaiting a liver transplant, a resident recites a long list of numbers from lab tests, but Whalen, in his role as a teacher, presses him to explain what is going on in the patient's body. "Those are the facts," Whalen told him. "Why do you think it is (happening)? What is the interpretation?" Whalen is nine months out of the hospital's three-year fellowship program in pediatric critical care. In his first week as an attending physician, he wore a tie to mock his status change, but now the ties hang behind his office door. "You get stuff on them," he said. "Saliva and urine, hopefully not your own." Some think of pediatrics as akin to veterinary medicine because the patients cannot tell you what they feel. Even if they are awake and old enough to talk, they often won't tell you they hurt because they fear what might be done to them. "I used to have sleepless nights," Whalen said of those early days as an attending physician. "You lie in bed thinking, `God, this kid could have an arrythmia, so-and-so could have this. This kid's life depends on what I did today.' "
His worries, like his ties, have been left behind. Lori Beattie, 22, who is waiting for a second lung transplant, has been in intensive care since last July, the longest stay for any of the current patients. Time drags and energy wanes by 5:45 p.m. but rounds continue. Some doctors lean against walls, and the lucky ones find chairs. Most began their day 12 hours ago, and they miss home almost as much as their patients do. A boy with a failing heart and a host of complications is not expected to survive. He is in one of the three isolation rooms used to separate a patient from the larger room because of severe illness, or to put barriers between a dying child and those who are healing. A discussion of what has been done, what can be done, what other doctors say and what the family will do keeps the team in one spot for what seems like hours. Everyone must understand what is expected and what is acceptable. Dr. Courtney Robertson, a critical care fellow who will be on call tonight, scribbles copious notes about each patient on a small slip of paper. By 6:40 p.m., the doctors are up to speed on all the patients. Those who are not on call go home. Robertson heads over to Michael Sarandrea's family. A large stapled incision shaped like an upside-down T marks the 15-year-old's distended belly, a reminder of his liver transplant the day before. A tube in his airway helps him breathe. She strokes Michael's hair and chats with his parents about slowly weaning him off the ventilator. If all goes well, he will breathe on his own the next day. His father nods happily, saying, "OK, OK."
At 7:10 p.m., the team prepares to do an intubation of another boy with breathing problems. Robertson will insert a breathing tube into the trachea, or windpipe. The tube will be hooked up to a ventilator that pumps air into and out of the lungs. His mom walks away from the bedside, frustrated and worried. Dr. Michael Whalen, left, reviews cases in the X-ray room with Dr. Neal Thomas. A nurse pushes a needle of medication into an intravenous line in the child's foot. The drugs sedate and paralyze the boy, keeping him from fighting. Robertson and a resident take turns grasping the boy's jaw and pulling it forward, a technique called a jaw thrust, to keep the airway open. Robertson uses a tool to push the tongue out of the way and lift the jaw so she can see the trachea's opening at the back of the throat. "My left arm, I got to start working it out. It's shaking," she said ruefully. A lot of force is required to make the airway visible in a large child. With her right hand, she inserts a long, thin tube into the trachea. The sickly-sweet smell of iodine hits the air as nurses disinfect the area around the boy's mouth. They tape the airway in place. The entire procedure takes about 15 minutes, and Whalen mainly watches and makes suggestions. Like other attendings, he usually leaves procedures to fellows who need the experience. But he enjoys hands-on tasks. Here are some facts about the pediatric intensive care unit at Children's Hospital. 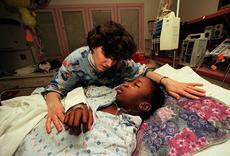 * About 2,000 children from all over the world will be cared for in Children's pediatric intensive care unit each year. A third will arrive by emergency transport. * About 5 percent of the unit's patients die there. * Average length of stay is six days. In that time, up to 50 medical professionals will be involved in a child's care. "I think it's why every one of us went into PICU - to be the one who intubates somebody or puts in a line. To take a critically ill child with an unknown diagnosis and with your own two hands and your eyes and brain, figure it out. 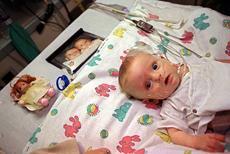 Do what needs to be done to save the kid's life," Whalen said. 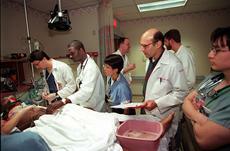 The doctors split up again to check on patients, write notes into the charts, assess a patient in the emergency room. Dinner ordered two hours earlier from an Oakland restaurant arrives after 10 p.m. The doctors eat hungrily and quickly down the hall in the fellows' office, which is decorated with Internet jokes and a doctored poster: The trainees have replaced the heads of male underwear models with those of the attending physicians. Whalen's face is not on the poster because he hasn't been an attending long enough. His grin is boyish and he looks too slight for the football he plays on weekends. Given a rare free moment, he will take his guitar up to the roof to jam with other musically inclined colleagues. He won't go home tonight and might not get home all weekend. He has just come "on service" and wants to know the patients and doctors better before he leaves them without direct supervision. "I have plenty of spare time - when I'm not on," he said. "But I tend to spend three times as much time at work than I should, and my wife will tell you the same thing." He decided to be a doctor when he was the same age as some of his patients - 4. It took him a lot longer to pick pediatrics, but he's happy with his choices. Around midnight, Whalen again coaches from the sidelines while a young doctor puts in a chest tube, a device used to expand a collapsed lung. The tube will allow air trapped outside the lung to escape from the chest cavity, freeing up space into which the lung can expand. Dr. Eric Katz, an emergency medicine resident at Allegheny University Hospitals, Allegheny General Hospital, who is getting some elective training, walks his fingers down the ladder of ribs along the sedated patient's right side until he finds the space between the fourth and fifth ones. He injects local anesthetic. Whalen leads a group of doctors on evening rounds. They check a patient who had been hit by a truck. Katz incises the skin and probes inside the wound with gloved fingers, pressing against muscle and bone. He opens up a soft spot with the pointy end of a pair of surgical clamps, making a hole. A lot of pushing and grunting follows as he feeds the tube into the space between the lungs and the inner chest wall. A hiss of escaping air tells everyone gathered near the bed that he has found the right place. After the procedure, Whalen tells Katz to phone the patient's mother at home and tell her what has happened. It's 1 a.m. The pace is faster in a pediatric unit than in an adult one. Children change more rapidly after an intervention than grownups, and require closer attention. Their tiny blood vessels often make starting intravenous lines far more difficult. The hours are grueling for the staff, Whalen said, but leaving the unit behind when his week as attending is up does not come as a relief. "It's one of the hardest parts of the job, a bit of a letdown and almost like a withdrawal," he said. "You've got very intense relationships with the parents and other family members." For him, going off service is still six days away. He and the other doctors will spend most of the night "putting out fires," admitting new patients and, about 2 a.m., running to the ward above to resuscitate a child whose heart has stopped. It is a good night in the unit. The doctors catch an almost unheard-of amount of sleep - two hours. In the morning, the other doctors wait at the unit's front doors. At 8 a.m., with Whalen at the helm, they gather near the first bed, ready to go around again.